A brand-new blackjack variant is making its way Down Under, with AGS’s Blackjack Buster being trialled at Crown Melbourne. AGS expanded into the gambling market with table games in the US last year, and now the most popular variant, Buster Blackjack, will be tested at Crown’s Melbourne casino due to a strategic partnership. 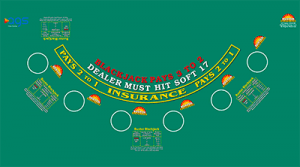 Buster Blackjack can be easily added to land-based casino blackjack tables as it is a side bet which players can wager on to be guaranteed a win when the dealer busts. The more cards in the dealer’s busted hand, the bigger the payout for the players. The partnership will see Buster Blackjack installed on 15 of the Crown 21 tables and could extend to more depending on the trial which is predicted to be well received due to the nature of the game – gameplay isn’t slowed down and bets are resolved fast. John Hemberger, Senior Vice President of Table Products at AGS commented the deal will no doubt be a permanent move. “Working with the team at Crown has been such a great experience – they are true professionals and very strategic operators,” he said. General Manager Table Games Strategy & Commercial at Crown Melbourne, Tim Barnett, said they noticed the table game in the US and saw its potential. “We first saw Buster Blackjack during a visit to the California market this autumn, and were really impressed,” he said. Executive General Manager Table Games at Crown Melbourne, Sean Knights, added side bets are incredibly popular with 21 players. “Our players have a strong appetite for this type of betting, and we’re confident it will do well as a dual side-bet on our blackjack tables,” Mr Knights said. AGS acquired Blackjack Buster in 2015 from Cadillac Jack and as the fastest-growing side bet table game it can now be found in around 90 casinos across the US including Vegas casinos such as Caesar’s Palace and The Venetian. While this is the first of its kind to be trialled at an Australian land-based casino, Aussies can play a similar title online at www.GDayCasino.com. The variant, with the same name as AGS’s version was created by Felt Gaming, a 2013 company which specialises in bringing North American style casino games to an online environment. It may very well have been based on the AGS variant found in the US, and now an Australian casino.